The EDGAR Editor tool on the ThunderDome® Portal enables users to edit their EDGAR documents directly online. This tool eliminates the need to hand-mark changes, send them to your provider, wait for them to send you a proof, and then review the proof for accuracy. Moreover, in addition to your ability to make edits to your filings directly, you will also have 24/7 access to our full-service team if there are ever edits you would prefer to have us do on your behalf. The exclusive cloud-based ThunderDome® Portal allows multi-user access to create, manage, edit, and file EDGAR documents with the SEC. The web-based portal creates significant efficiencies to users as it enables version control and collaboration while also eliminating the need to manually hand-mark EDGAR changes only to then wait for your provider to return a proof. RDG has designed this to be a Hybrid solution, so our clients enjoy the perfect combination full-service expertise when they need it, and in-house control when they want it. Our EDGAR professionals remain available 24/7 for full-service EDGAR conversion, editorial service, and support. 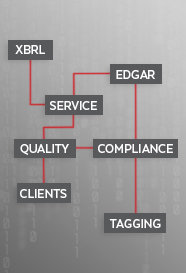 US-based experts do all the XBRL tagging and validation on a full-service basis, and a dedicated Account Manager is available to you for questions and consultation. You will simply review the tagging on our superior online XBRL review tool, which is an integral aspect of the ThunderDome® Portal. RDG’s combination of Service & Software is the best of both worlds. Full-service expertise when you need it and in-house control when you want it. Consider us the “Peanut Butter & Jelly” of the SEC Filings industry. Maybe you prefer “Burger & Fries” or “Coffee & Doughnuts”, in any case, we have the perfect combination.